1 - Look at the magazine in normal light. What colours can you see? 2 - Go outside and look at the colours again under an orange (sodium) street light. How are the colours different? In normal light you can see lots of different colours on the magazine - in fact, it looks just like you'd expect! 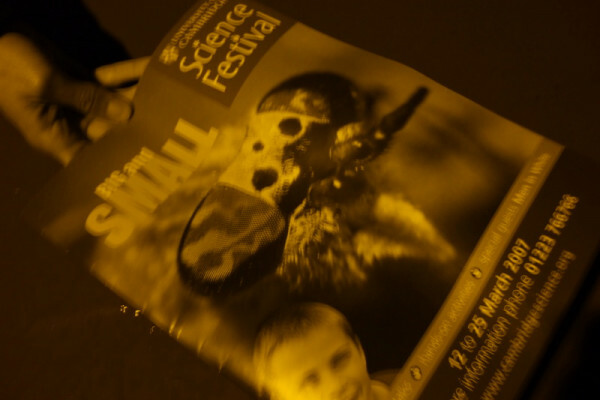 However underneath the orange street light, the magazine looks various shades of yellow. Firstly we need to look at why we can see the colours in normal light. White light contains all the colours of the rainbow from red through to blues and purples. Each colour has a different wavelength, but if you add all the wavelengths together you end up with white. If you shine white light onto an object and it looks green, this means that most of the red and blue wavelengths have been absorbed by the object and the green wavelengths have been reflected into your eyes. Similarly if an object looks blue, it means that most of the red and greeny wavelengths have been absorbed, which leaves the blue to be reflected. So why do all colours except yellowy-orange disappear when we look at the magazine under the street light? Street lights are a very special kind of yellow light in that they only produce a very narrow set of colours. So rather than giving out a bit of every colour of the rainbow (as with white light), only yellow-orange wavelengths are given off. When this light hits the magazine there are only two options: either the ink on the page absorbs yellow-orange light, or it reflects it. If it absorbs yellow light then there is nothing left for it to reflect - remember that these street lights ONLY produce yellow-orange light and don't give off green and blue and all other colours - and if there are no wavelengths of light to reflect back, then we just see shades of grey. However if the inks do reflect yellow, then we will see yellow colours on the page. The overall outcome is a magazine that appears to be various shades of yellow-orange and grey - essentially monochrome. But this doesn't happen under all orange lights. What happens if you look at the magazine under the orange indicators of your car? It turns out that you can see all the colours visible under normal light conditions... spooky! Under the orange street light we could only see yellow and grey, but under the light of an orange car indicator we can suddenly see them all again. Why is that? Thankfully it's not that spooky at all because there's actually more than one way of making orange light. You can either make it out of pure orange light, as is the case with a sodium street light, or you can make it out of a mixture of red wavelengths, a bit of green, a few yellow wavelengths and a bit of orange. So just as white light is made from lots of different wavelengths, the light from an orange indicator is also made from different wavelengths. This means that when the light hits the magazine, the inks that reflect green are able to reflect green and the inks that reflect blue can reflect blue, and so on. And this is possible because there are a range of different wavelengths given off in the first place. So although the two types of light both look orange to us, they are in fact very different: one is made of pure orange and the other is orange made from a mixture. The conclusion is therefore that we can't be sure that orange is orange unless we try this experiment, and you'll have to wait for another Kitchen Science to discover if we can be sure as eggs is eggs. How and why do chameleons change colour? How fast does my toothbrush vibrate?